Home > News > New adventure play equipment now installed! New adventure play equipment now installed! 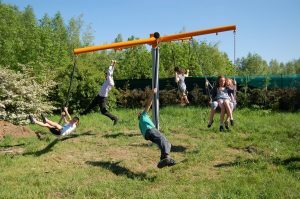 A zip wire, in-ground trampoline and two swings are now installed to make a new play area for older children and teenagers in the upper Louie Memorial Playing Field, behind the MUGA. Following consultation with local young people, we used Section 106 funds (contributions from housing developers) to purchase equipment to form this new play area as part of the proposals to rejuvenate the playing fields and Pavilion for all users. The installation was completed on 18th January. Please go and visit if you’ve not done so already. For more details see the Louie Memorial page.